Members of the church of our Lord are taught to pray. Any Christian who loves God surely will consider prayer to be a most essential evidence of love for God and a right relationship with God. Since there are many abuses of prayer one may pray and still not have assurance that God hears and accepts his or her petitions. The Pharisees loved to pray, but their prayers were not acceptable to God (Matthew 6:5; 15:7-8). Their long prayers, uttered to be heard and praised by men, received no reward from the heavenly Father. Empty repetitions in prayer do not reach the ears of God; words without thoughts may please men but they are a mockery to God. "God hear- eth not sinners: but if a man be a worshipper of God, and do his will, him he heareth." There must be proof that we love God before we can pray acceptably (1 John 3:18). Evidence that we genuinely love God is shown when we believe in Jesus Christ and obey his commandments (1 John 2:1-5). To know Christ and to keep his commandments is not grievous (1 John 5:3). This involves believing (1 John 3:23; 5:1), turning from sin (1 John 3:6), confessing faith in Christ (1 John 4:2,15), being born again into God's family (John 3:5, Acts 2:38, Romans 6:1-6), and striving to observe all things he commanded until death (Matt. 28:20). Having evidenced our loved for God in obedience, we are cleansed of sin by the blood of Christ, and are added to the family of God, the body, the church of Christ (Acts 2:47; Galatians 3:26-27). After Christ established his church in 33 A.D., there is no record of any man being told to pray until after his sins were washed away through obeying the gospel (see 1 Peter 1:22). For this reason, in churches of Christ no "mourner's bench" or "altar to pray through" will be found. Prayer is a privilege for those in the spiritual family, the church, rather than the means of entrance into it. Although sinners are not saved through prayer from their alien sins (those sins of their former lives before they came to Christ), yet they must come in a prayerful, penitent and humble attitude like Saul of Tarsus did (Acts 9:11) when they inquire what they must do to be saved (Acts 2:37-38). After obeying Jesus' commandments for salvation (Mark 16:16), then prayer is a daily essential in the personal life of every Christian (1 Thessalonians 5:17). It is also prominent in the worship assemblies of the saints. Through repentance and prayer, forgiveness of sins is obtained by the child of God - forgiveness for his shortcomings continued from day to day through ignorance, weakness or negligence (Acts 8:14-24). FOR WHAT DOES THE CHRISTIAN PRAY? 1. Adoration, and Praise of God. God's holy name is to be hallowed when we pray (Matt. 6:9). We thus place God where he belongs - far above us, majestic, perfect, sinless, great, pure, ever-present kind and good. "We are dust" (Psalm 103:14) and worthless in relation to the Almighty God, ever-to-be adored. 2. Thanksgiving. Thank God for everything! For the gift of the Holy Spirit, for the gift of God's love, for Christ, his church, our Christian brothers and sisters, our families, and all God's innumerable blessings. Many Psalms are outpourings of gratitude in prayer (see Psalms 8, 9, 30, 35, 103, 117, and 118 as examples). 3. Wisdom. God will grant wisdom to those who ask (2 Chronicles 1:1-13; James 1:5). We gain knowledge of God's will through a study of the Scriptures (2 Timothy 2:15; 3:16-17; Psalm 111:5), but the ability to discreetly use the knowledge comes through prayer. 4. Others. 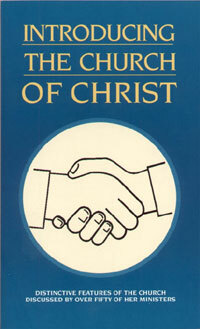 Members of the churches of Christ pray for preachers and teachers of the gospel and for elders (2 Thess. 3:1). They pray for all Christians (Colossians 4: 2-3; Hebrews 13:18) as well as for government officials and rulers (1 Timothy 2:1-2). Jesus taught us to love our enemies and to pray for them (Matt. 5:43-45). Christ died for us "while we were yet sinners" (Romans 5:8), so it behooves his disciples to love and pray for all men, including them that persecute you." 5. Deliverance from Temptation. Jesus told his disciples to "watch and pray, that ye enter not into temptation; the spirit indeed is willing, but the flesh is weak" (Matt. 26:41). He said further in the model prayer, "And bring us not into temptation, but deliver us from the evil one" (Matt. 6:13). God does not tempt us (James 1:12-16), but he does allow us to be tempted. He will not "suffer you to be tempted above what you are able to bear; but will with the temptation make also the way of escape, that ye may be able to endure it" (1 Corinthians 10:13). 6. Peace. The world needs peace today, but it cannot be obtained in the many ways by which man has sought it in the past. Read Philippians 4:6-7 for God's way to obtain a lasting peace. 7. Unity. Jesus, the Head and founder of the true church, prayed that all disciples who believe on him might be united together with each other, the same as he and his Father are "one" (John 17:20-21). Since the prayer life of Jesus is an example for members of his church, we should pray for all Christians to be one, to be "perfectly joined together" in one mind, in the one body, the church (1 Cor. 1:10-13). Divisions over names and doctrines are sinful and we are commanded to avoid the party spirit within the church. We should therefore pray fervently that denominational divisions be utterly and quickly destroyed. If we "obey God rather than men" (Acts 5:29) and speak only "as the oracles of God" (1 Pet. 4:11) there will be unity in the one body, the church for which Christ died and to which he adds the saved (Acts 20:28; 2:47). Truth and unity constitute a great part of Jesus' prayers to the Father. When we pray "in faith" and "according to God's will," God will hear us and will answer our prayers (Matt. 7:7-11; 21:22; 1 John 5:14). Some who pray are not heard because they ask for things to gratify their own lust (James 4:1-3). Prayers must be honest, sincere (Psalm 17:1; Isaiah 29:13) and humble (Luke 18:14). There is "one God, and one mediator between God and man, himself man, Christ Jesus" (1 Tim. 2:5). In spite of this plain teaching in the Bible, today the religious world recognizes literally hundreds of mediators. Some say to pray through Mary; others say, "No, pray through Mohammed" or some other prophet or man. Friend, there is no priest on earth through whom God is approached. Pray to God through the one he has appointed (Heb. 4:14-16; Col. 3:17; John 14:4). Can you give a biblical example of prayers that were not acceptable to God? What Bible teaching regarding prayer is violated by praying memorized prayers with (or without) beads? Does God hear and answer prayers of those who have not obeyed the gospel of Christ, and who are not in the spiritual family, the church? Can you give any Bible reference for women leading in a public prayer in assemblies when men were present? What does this suggest about church leadership today in the light of such passages as 1 Timothy 2:8-12? Name some things for which Christians are to pray.